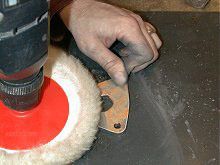 We “home brewed” a cover plate for the front cover on the blower using ¼” aluminum. 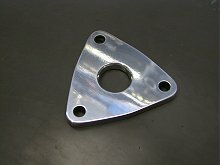 The oil level in the front case needs to come to the center of this plate. Normally the way to check the oil level of your blower is to pull out the center (left) bolt on this cover. I decided to put a sight glass in the center of this plate as an easy way to check the level. 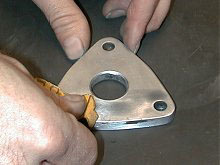 The center ¾” hole will be pipe threaded to accommodate the sight glass. This plate covers the area that would normally be the water pump drive on a diesel. Then it was polished it up a bit using 800 grit wet paper first and then rubbing compound with a buffing wheel on a drill. It should look fine when it's finished and make checking the oil an easy job.